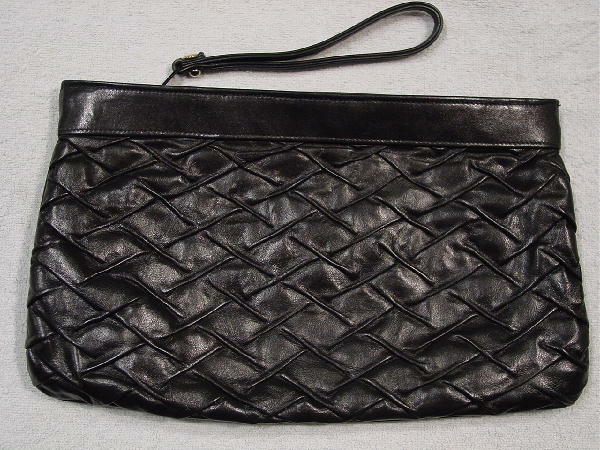 This black leather clutch can also be carried by its 6" long wrist strap. The surface gives the appearance of being woven, when it actually has elevated folds of leather (ruched) running in a diagonal diamond shape pattern. The interior feels like brushed cotton, and it's in a warm tan-bone color with Mr. Leather written all over in brown. There is one interior zippered pocket with an orangy-mustard color fabric. It's from a retired Australian model.